Bukit Lintang Sewu has a natural landscape that is undoubtedly beautiful, especially when dusk comes. In this Lintang Sewu Hill we will be presented with the beautiful sunset behind the hills. Lintang Sewu is taken from Javanese which means “A Thousand Stars”. Because besides being able to see the beautiful sunset, on this Lintang Sewu Dlingo Hill we can also see the beautiful glitter of city lights at night which looks like a star on earth. 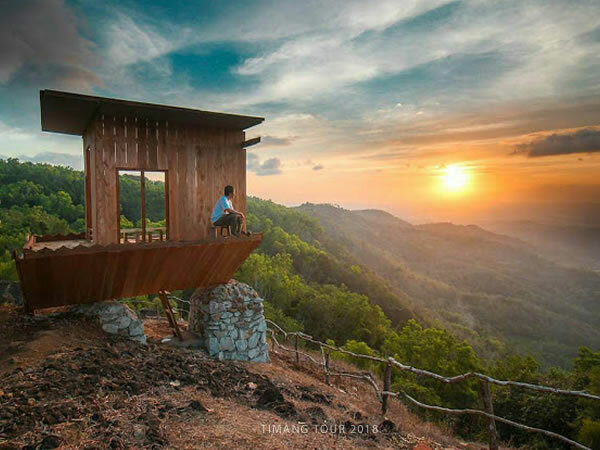 At the top of Lintang Sewu Hill (Bukit Lintang Sewu – ID) there are also several viewing booths and temple-like buildings that we can use to take pictures, besides that the peak of Lintang Sewu Hill is also quite extensive, so it is suitable for camping. The view from the top of Lintang Sewu Hill is quite interesting because from this place you can see the view of the city of Yogyakarta from a distance. When you look down, you will see lower hills. If the weather is sunny and the sky is clean, there will be a range of Menoreh mountains, Mount Sumbing, and Mount Merapi from this hill. The sunset or sunset is clearly visible, because the position of the hill is facing west and there is no barrier in front of it. The view of the sunset at this place is almost the same as Becici Pine Peak because the two hills stand side by side and have almost the same angle of view. For sunrise or sunrise events, this hill is not suitable and visitors are welcome to enjoy it on other hilly tours such as Bukit Panguk Kediwung, or Mangunan Fruit Garden. The position is quite strategic because it is adjacent to tourism objects that have become top attractions such as Mangunan Fruit Garden and Mangunan Pine Forest. The hill has been developed into a tourist area since the beginning of 2016 along with the Pinus Dahromo Forest, Pengger Pine Forest, and Watu Asah-Asah Nature Tourism. The location of Lintang Sewu Hill is in the hills of Dlingo Bantul precisely adjacent to the Dahromo Pine Forest. There are two routes or access roads leading to the location of Becici Dlingo Peak, the first through the Imogiri-Dlingo line from the direction of Bantul district and the second through the Patuk-Dlingo route from the direction of Gunungkidul district. The difference between the two access roads when taken from the center of Yogyakarta is not much different because the location of Bukit Lintang Sewu is in the middle of the road from the two access roads. However, the first route was chosen by tourists because it passed several well-known tourist areas such as Mangunan Fruit Garden and Mangunan Pine Forest. The position of Lintang Sewu Hill is after the Mangunan Pine Forest and before the Dahromo Pine Forest.